Brouwer, a much honored and retired head of the composition department (1996-2008) at Cleveland Institute of Music, presents here a number of chamber pieces in varied styles – even within particular pieces. These range from her arrangements of the Bach and Debussy (no stylistic shocks); to flat out beautiful melody in the long second movement of the Quintet and the song for soprano (both from the same year); to lovely lyrical and programmatic effects in Lonely Lake; to strong expressions of anger over the state of the world in other movements of the Clarinet Quintet. 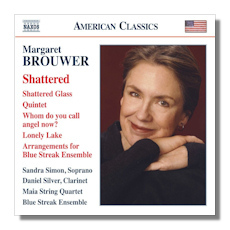 Shattered Glass (twelve and a half minutes), which the composer describes in terms of constantly changing colors – which one hears, has what Brouwer calls "two contrasting yet related sound worlds…" from "a soft but brittle atmosphere with sharp stabs of piercing sound that sometimes builds to wild cacophonous moments, and soft, blurred mysterious sections." The percussion is exciting and a flute solo is particularly appealing. Brouwer characterizes the Quintet (19:42) as a multicultural and "complex expression with many layers, overlaying a twelve-tone harmonic plan with tonal sonorities as well as Middle Eastern influences." The scherzo is very brief and the final movement "employs a strict twelve-tone row with no inclusion of other harmonic material," something she says she rarely does. Lonely Lake (eleven and a half minutes) was commissioned by a Canadian couple and named for their small settlement accessible only by boat. It explicitly includes the calls of several birds: sand hill crane, wood thrush, belted kingfisher and song sparrow early on, and it closes with sounds of loons at dusk. In between there are suggestions of human activity – swimming in early morning in brilliant sunshine, something Brouwer sees in terms of vivid color. Strictly musical effects include percussion ranging from vigorous to gentle and fluttery, and a jazzy passage. My wife loves this piece.